A knifeman has killed one person and wounded four in a suspected terror attack in central Paris, French officials say. The attacker was then shot dead by police in the Opéra district. Witnesses say they heard him shout "Allah Akbar". So-called Islamic State (IS) later said one of its "soldiers" had carried out the attack on Saturday evening. Judicial sources told French media the attacker was a man born in 1997 in the southern Russian republic of Chechnya. The sources said his parents had been held for questioning. Interior Minister Gérard Collomb said the victim of the attack was a 29-year-old man, but gave no further details. French President Emmanuel Macron tweeted (in French): "France has once again paid in blood, but will not give an inch to the enemies of freedom." How did the events unfold? 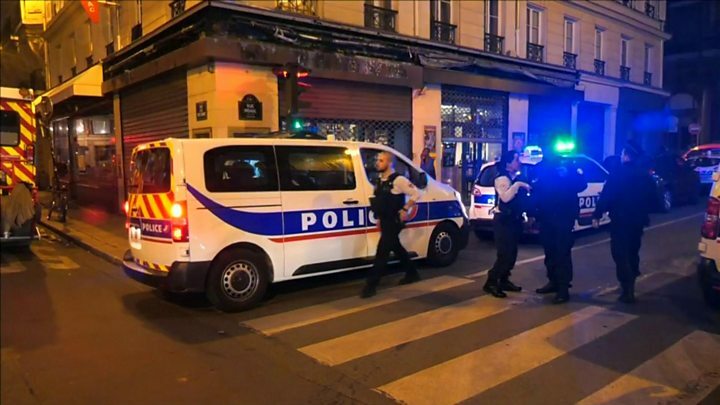 The attacker began stabbing passers-by at about 21:00 local time (19:00 GMT) on the rue Monsigny. Eyewitnesses described him as a young man with brown hair and a beard, dressed in black tracksuit trousers. The man tried to enter several bars and restaurants but was blocked by people inside. Police arrived at the scene within minutes. They first tried to stop the assailant with a stun-gun before shooting him dead. An eyewitness, named as Gloria, told AFP news agency: "We didn't know what was going on, we were quickly moved inside the bar, I went outside and I saw a man lying on the floor." Jonathan, a waiter at a local restaurant, told AFP: "I saw him with a knife in his hand. He looked crazy." He said a woman the attacker had stabbed ran into into the restaurant bleeding. The assailant tried to follow her inside, but was fended off and finally fled. Two of the wounded in the attack are in a serious condition but do not have life-threatening injuries. Later in the evening the IS group said it was behind the attack, in a brief statement posted on its news outlet. How did French authorities react? The anti-terrorism unit of the Paris prosecutor's office has launched an investigation. Prime Minister Edouard Philippe said police were on the scene five minutes after an emergency call and the attacker was killed "less than nine minutes later". Mr Collomb praised police for their "cool response". He said his first thoughts were "with the victims of this heinous act". Paris Mayor Anne Hidalgo tweeted (in French): "Tonight, our city was bruised." "I want to tell them that all Parisians are on their side," she added. How has France been countering security threats? France has been on high alert following a series of attacks. More than 230 people have been killed by IS-inspired jihadists in the past three years. The deadliest violence occurred on 13 November 2015, when gunmen and suicide bombers struck various venues in Paris almost simultaneously - killing a total 130 people. After winning last year's elections, President Macron pledged that fighting Islamist terrorism would be his top foreign policy priority. Defeating IS in Iraq and Syria must go hand-in-hand with anti-terror measures in Africa, he said.